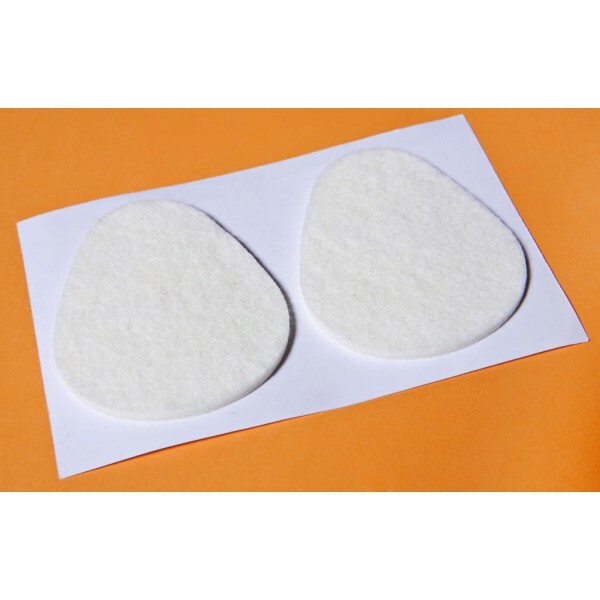 1/8" Felt Metatarsal Pads are great to relieve pain on the bottom of the ball of your foot. Common ailments include metatarsalgia and Morton's neuroma. Prices are per pad. The Felt Metatarsal Pads help to treat turf toe, sesamoiditis, hallus limitus, hallux valgus or bunion, metatarsalgia, painful pressure points, calluses. Prices are per pad. The picture shows two pads. The 1/8 inch thick with a self-adhesive back is used for easy application. Designed to re-distribute weight and direct pressure more evenly over the area applied. Used most common on the ball of the foot. How to apply: Gently apply to clean dry foot. Remove adhesive back and apply pad just behind(heel side) the area of pain. The pad may cause increased discomfort if applied directly over the area of pain. These pads are designed to place directly to the foot, however, can be placed directly to the shoe itself. Recommended Care: the pad is designed for single application. Dispose after use. The life of the pad is determined by its care, use, and activity level. Multiple days use is possible based on these same parameters. Precautions: Do not use adhesives if you have sensitivies to allergies to latex or adhesives. Don not use if diabetic or have lost feeling in your foot or ankle for any reason. Felt absorbs fluids very easily, hence, it is not advisable to get felt padding wet. Compression, friction, and wear cause felt to lose resilence and eventually degrade. Uniqueness of product: Performancefoot.com is unique in that there are no other single use pad providers with pads available to consumers on the market today. These pads are proven, practical, and pertinent to consumers in the self foot care marketplace.